TORONTO, ON – The Ontario Craft Brewers have announced that the second edition of their popular Discovery Pack series of mixed six-packs will be returning to LCBO store shelves in May after selling out its first run late last year. The beers in this pack include Robert Simpson Confederation Ale, Mill Street Tankhouse Ale, Trafalgar Elora Irish Ale, Black Oak Nut Brown Ale, Cameron’s Auburn Ale, and Nickel Brook Apple Pilsner. 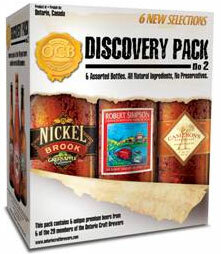 The OCB have also announced that Discovery Pack No. 3 is due out in November and will feature six different canned beers.